Misty is a cellular immunologist who researchers the white blood cells of the immune system, called cytotoxic lymphocytes. She has trained in world-leading laboratories including the Doherty Institute, Cambridge Institute for Medical Research and the Peter MacCallum Cancer Centre. 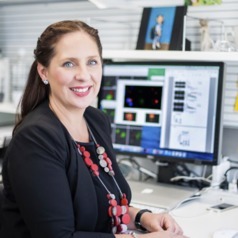 She is currently a NHMRC fellow at the Walter and Eliza Hall Institute, where she leads a small team. Her research interests include, understanding how cytotoxic lymphocytes form an immune synapse with their target cells, harnessing the power of cancer immunotherapy and establishing long term protective lymphocyte memory. She was the Tall Poppy of the Year (2015) and was awarded the L'Oreal for women in Science Fellowship (2013). In addition to her research career, Misty has served on multiple institutional and government education and advisory committees. Misty is a strong advocate for biomedical research, mentoring, gender equity, professional development and science policy. She is a governing board member of the National Centre of Indigenous Genomics (NCIG) at ANU and a descendent of the Gunditjmara people.